Hint: Something purchasable at one point but is no longer available. Some of you already know this. You’re supposed to air out a tea, if it’s a traditionally stored puerh. The problem with traditionally stored tea is that if you don’t air it out, all kinds of nasty, “storage” smell remain, and will affect how much you can enjoy your tea. This point hasn’t been illustrated as clearly as what I recently did with a bag of tea that a friend brought back for me. It’s from one of my favourite stores in Hong Kong that sells such things. The tea is very wet stored — you can smell the storage from a mile away, and is not for those who don’t like that kind of taste. When I first opened the bag and brewed some, it was horrible. It smelled fishy, moldy, rotten. The first few cups I couldn’t drink at all. I started wondering if I got a bad batch. The friend, however, knows what he’s doing. When he visited the shop, he noticed that the stuff in the jar, which is what they usually use to fill these smaller orders, was rather moldy. He thought it better to buy some that were “cleaner”, so he asked the owner to show him a few bags of the stuff from the back. The owner duly complied, and my friend picked out some from a good looking bag. This is all good, except, I think, because the bag was relatively unopened, the tea still retained much of the storage smell, and it’s not pretty. Fast forward two weeks — I’ve had the bag opened for that long, just sitting on my table. I thought it probably best to let it air out a bit, to release some of the more “toxic” flavours from the bag. I tried it again yesterday — no more fishy smell, or rotten carcass. It’s gone. Now, instead, much of the sweeter note that I love from this store emerged. No problems — it’s just a matter of airing out the tea. Or more exactly, semi-outdoor tea. It’s always nice to have a chance to sit outside and drink tea, rather than cooped up in my own little room facing a wall. The weather is nice and finally, warm enough for tea drinking outside, so onto the balcony I went. A little traditionally stored, loose puerh. I like drinking these things. They are easy to make and pleasant to drink, as long as it’s stored right. I also like drinking them out of bigger cups. Small cups, especially tiny ones, are not meant for puerh. Drink all the oolongs you want in the small cups, but puerh, in particular those of the traditional storage variety, belong to bigger cups. I’ve also noticed a steady drift towards larger teaware once again, having eschewed it for a long time. For a while, smaller pots/cups was the rule of the day, maybe partly because I was under heavier influence from those whom I first learned about gongfu tea. However, as I drink more, I find myself prefering slightly larger wares. Perhaps it makes more sense for the lone tea drinker who has to consume it in isolation. Maybe if I always have friends to share it with, smaller cups will once again make their appearance. This tea today revealed a new side to me as I was listening to the cardinals sing their songs, with my cats watching them rather intently (and perhaps menacingly). The tea tastes a lot more floral and, at the same time, spicy than when I brew them in a larger pot with a view of just gulping them down for general consumption. It’s just better. Maybe it’s the smaller (relatively) pot focusing the flavour of the tea better, or maybe the environment helped me concentrate, at least until I was chased away from the downstairs neighbour grilling their meat on their barbeque. They come in bags, jars, boxes, cases…. loose puerh come in all shape and sizes, and they are notoriously hard to identify if you are only looking at the dry leaves. What is this, for example? Even without the problem of trying to identify a tea through pictures, loose puerh of all types are difficult to classify without a taste test. They all look the same, especially if they’ve been aged a bit through wet storage — dark, musty, with a fine coating of white sometimes, loose, usually broken, and nondescript. The telltale signs that you can use to identify cooked vs aged in a cake don’t work so well with loose, because they are not as obvious. Throw in the wet storage, and everything gets even harder. What, pray tell, is this anyway? Any number of combination of factors can give you this. But even then, heavily wet stored tea, or border tea, can give you something that looks like this. Ultimately, it’s what goes in the mouth that counts, and from that I can pretty safely say this is a lightly wet stored cooked loose puerh. It has that mellowness that you only get with cooked tea — aged raw, even if heavily wet stored, doesn’t taste quite the same. Also, those tend to revert to a greener/browner complexion when brewed heavily, while this tea never did. The price is a confirmation of this: at $10 CDN/100g, it’s pretty cheap. I got this as a sample and was asked to identify this “20 years Yiwu”. That already rings a few alarm bells — no such thing exists, not because Yiwu didn’t exist, but because back in 1989, Yiwu produced very little tea, and nobody paid attention to exactly where the tea was coming from — certainly not enough for a bag of tea to be able to trace its origins to the holiest of mountains. The leaves are quite broken, so there’s really not much you can tell from that. The price is far too cheap. Cheap things can be good, and expensive is no guarantee of quality, but known good things, such as a 20 years old Yiwu, is not likely to be knowing sold at a great discount. I’ve said this before, but I’m reminded of this issue again today. I think one of the easy mistakes that newcomers to tea make is an over emphasis on the first few infusions. This is especially true of puerh, particularly the aged or wet stored type. 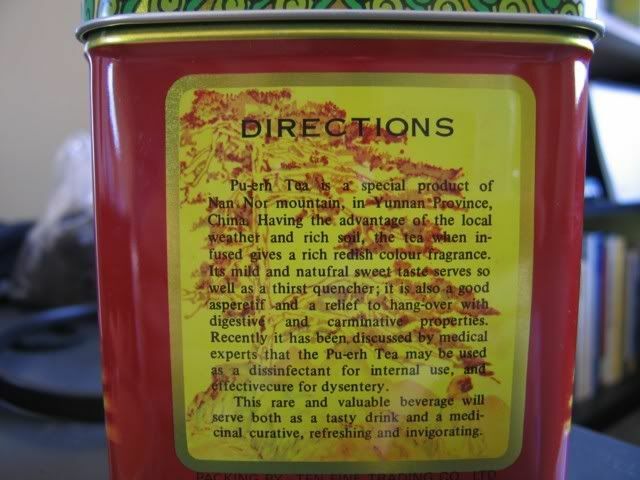 I am reminded of that today as I drank some supposedly 30 years loose puerh from Hong Kong. It starts out a little bitter, wet stored, with a strong taste of some Vietnamese tea mixed in. After a while, however, it mellows out, turns sweeter, and gives a rounder body to the taste. Then, even later (we’re talking 10+ infusions) it turns very sweet, mellow, and still very fragrant, with an almost perfumy taste/smell. It’s very clear that the best was at the end, not the beginning. 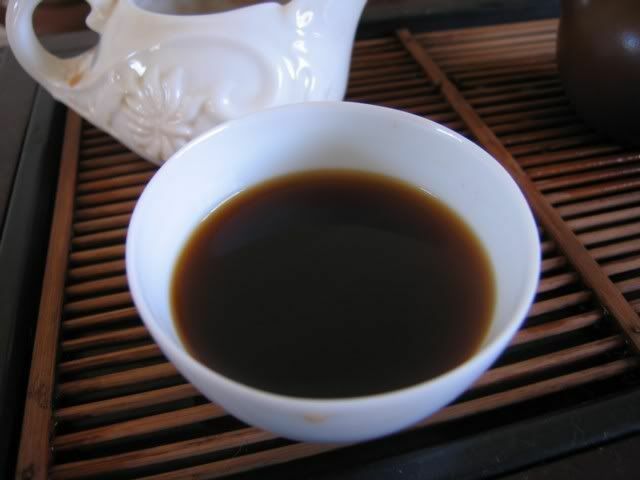 My friend has told me how puerh drinking really only STARTS at the fifth infusion. Everything before can be discarded. This applies mostly to her stuff of 30 years old or so. While it’s certainly a waste to, say, dump five cups of Red Label down the drain, it is equally wasteful to stop too fast because of either a lack of immediate interest or a lack of stomach. This is true also for the evaluation of newer teas. While it is not the sole criteria for determining the quality of a tea, how long it lasts and how fast it dies is an important indicator. I drank some younger puerh recently that will always yield an extra cup no matter how far I’ve gone, while some others completely give up after maybe 10 infusions and give you nothing but water. Longer lasting tea is always better than the ones that die. If it’s weak now, what does it have to give you after aging? Which also brings into question the size of the vessel you use to make tea. If the pot you’re using is too big, for example, so that you can’t drink more than say 7 cups before feeling totally exhausted by the tea, then you should perhaps consider something smaller. This is a particularly acute problem in the non-Asian world, as the norm is to drink alone, not with company, making a long session of tea harder to achieve. If your pot is too big (say, 150ml) you might be drinking a litre or more of water and still be nowhere near the end of the tea if you’re on your own. It’s definitely something to consider. * This is a column entry that will go into the latest issue of the magazine my friend edits in Beijing, but you’ve seen this here first. Some of them are points that I’ve made before in various forms, so sorry for boring those of you with a good memory :). 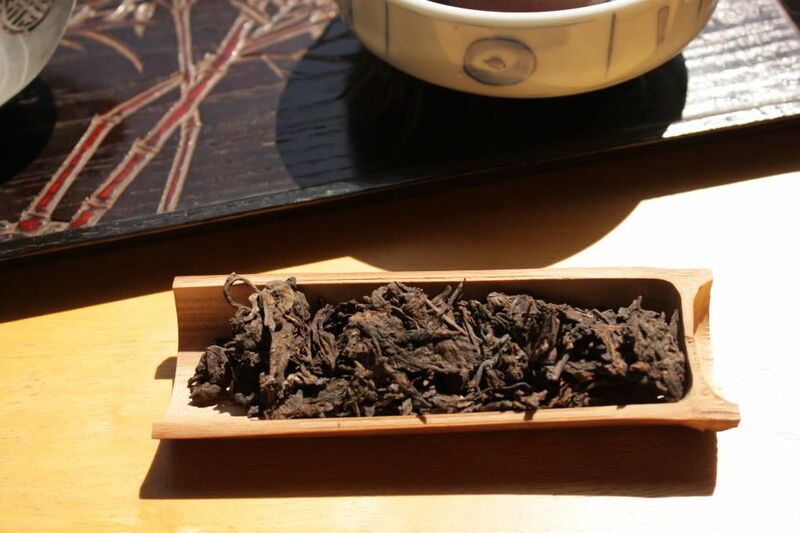 For the past few years, puerh has been a typhoon that swept through the tea drinking community. Almost everybody, from old hands to newcomers, were swept up in its wake. 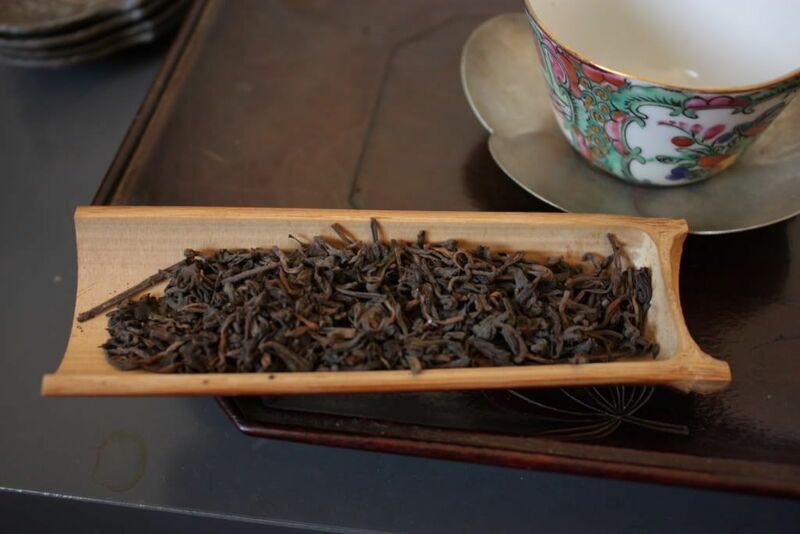 Interest in this tea skyrocketed, and for a while, a bubble formed with the puerh market. Although things have subsided somewhat in the past two years, there is still plenty of interest and the landscape of puerh production, consumption, and storage has been permanently altered. One of the issues at hand, storage, is a complicated matter that has led to much ink being spilt. Definitions of good and bad storage differ, and commercial interests, unfortunately, are heavily involved as old tea fetches astronomical sums. Those who have one sort of tea will claim it is the best, while some others who own another type will claim that in fact, theirs is the best. Confusion, unfortunately, is the name of the game. As the inventor of wet storage, people from Hong Kong and Macau tend to have a fairly strict definition of what it entails. 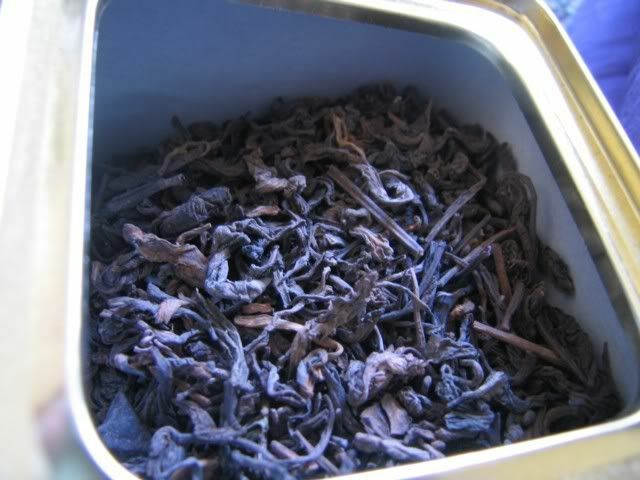 I think largely we can summarize it as puerh that has been stored in an artificially wet condition with elevated temperature, for the specific purpose of speeding the aging of the tea and to change the character of the tea in question. This is sometimes also called “ground storage” as many of these storage facilities were basements or built into a hill. Until maybe ten or fifteen years ago, there was no such thing as “wet” or “dry” storage. A friend of mine who has been drinking tea seriously for twenty years told me that when she first started learning about puerh, she, and some friends of hers, went to some of the very old shops in Hong Kong to search out puerh cakes. They wanted, however, to find cakes that were green – young cakes, so that they can store it themselves. When they asked, the storekeepers generally gave them a strange look, and asked why on earth would they want such a thing – these teas are undrinkable! Needless to say, their expedition was unsuccessful. Nowadays, it is much easier to find raw cakes that have not gone through such storage, but back then, it was nearly impossible. These days it is much easier to find such cakes that have not gone through such storage condition. For the most part, private collectors or tea investors generally try to store them in a natural environment. What this means is that the storage space is not artificially enhanced with moisture or temperature, but just left alone to the natural cycle of the weather. My friend who tried to buy her tea in the 1990s has been doing that for a dozen years, and is now enjoying the teas that she has in her collection, some of which are very nice. This, to people from Hong Kong anyway, are what is generally called dry storage. When I was in Taiwan doing research I noticed that they have a varied amount of terminologies used to denote different types of storage conditions. One of them is “Hong Kong storage”, which to them means wet storage. However, I have noticed among friends and shops that many teas that are so called “Hong Kong storage” were in fact stored in Taiwan. Taiwan, it must be remembered, has even wetter conditions than Hong Kong. Humidity is higher in many parts of Taiwan, and rainfall is continuous for weeks at a time. For dry storage, there is also a nuanced distinction between just regular, natural storage, and storage that sometimes includes climate control. I remember in about November when I was in Taipei, the weather had turned cooler, but not cold. I usually left my window open in my 8th floor apartment during the day. There was a week when rain fell almost daily. The bulk of my tea cake collection was sitting on a loft area, far away from the window, but two or three cakes I left underneath the coffee table for easy access as I was drinking them. They were wrapped in their original wrapping paper and sat at least a foot off the ground and a few feet away from the window. The cakes were certainly not touched by water at any stage. Yet, in about two weeks, I noticed that the cakes were quite damp, and that there was the first signs of mould growing on the cake. This, to me, was quite an interesting discovery, because it showed that in a natural environment, away from direct contact with moisture, it was still possible to have mould growing on tea in a place like Taipei (and remember, I was on the 8th floor, not in a basement). So, even if a tea is “dry” stored, it is worth keeping in mind what that means for the tea. When I was in Beijing doing research, I lived there for a year. In that year, I spent probably more time trolling the tea markets than anything else, and was able to gain some insight into not only the tea market but also what people thought about what they were selling and drinking, largely through talking to a wide variety of people, from girls who came from tea farms in Yiwu to Beijing entrepreneur-turned-tea merchant. While this does not mean that what I found was a China-wide phenomenon, I do think that there’s some representation in terms of Yunnanese views as well, as Kunming is also a very dry climate (although not nearly as cold). Basically, anything stored in Southern China is considered wet. I remember trying a few teas that were maybe about 10 years old by Southern China standard and certainly dry stored (again, by that standard). The almost unanimous response was “this is wet stored” and “this is poorly stored”. They demand a very dry kind of storage up north, where teas change very slowly and retain much of their original character through storage, mellowing very, very slowly. If you show them truly wet stored (i.e. ground storage) teas, they often think it is cooked puerh, or simply don’t recognize what they’re drinking. Part of this, I think, is historical. 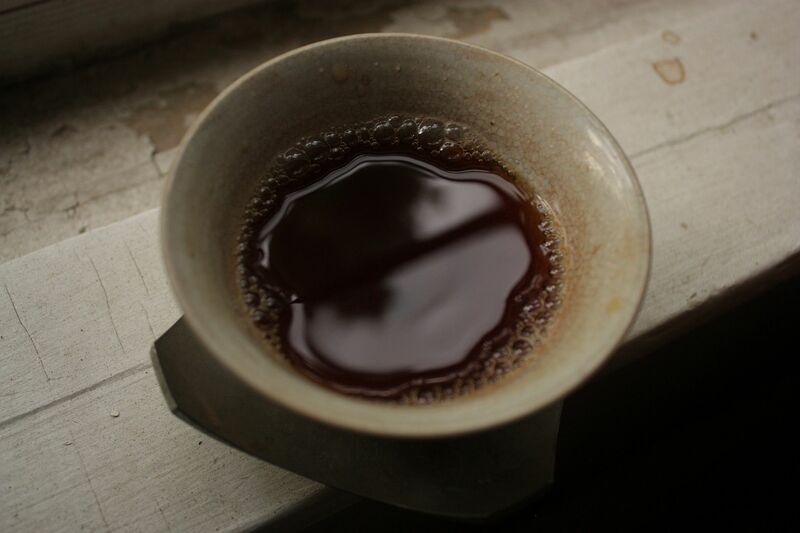 Puerh really wasn’t consumed outside of a few provinces in the south and Southeast Asia, and so the experience of the Beijingers have been much shorter, generally (at this point in 2008) about five years old or so. Prior to that, they drank light tieguanyin, and before that, longjing, and a little further back, jasmine. 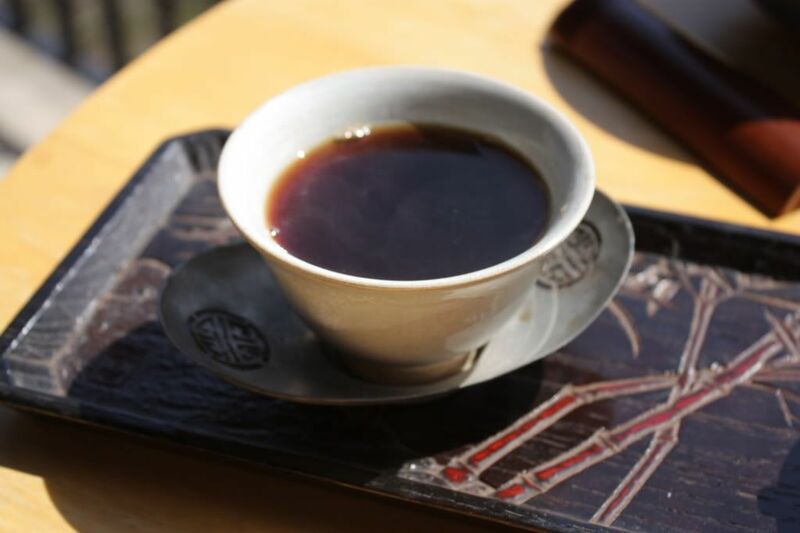 Their tastes tend to the fragrant and light side of things (perhaps an antidote to the heavy food) and I think this preference shows itself in their choice of puerh as well. So what is wet storage in the Occident? Well, I can’t speak for everybody, but I think a survey of the internet is probably a pretty good approximation of what the consensus is. n differentiate the different kinds of storage. While I was lucky to be guided by more experienced hands, and have had the opportunity to drink a wide variety of teas, many in the West rely solely on retailers who sell through the internet. The teas being sold through this medium are, for the most part, young cakes that are under 10 years of age. There is also a selection bias in the inventory of such vendors, and so they often only reflect one philosophy with regards to proper storage condition. What I find generally true is that “wet” storage has been largely seen as a bad thing – it is believed that it affects the tea negatively. I have also seen an interesting obsession with the idea that teas need to retain their “true” “authentic” flavour, and “wet” storage is seen as something that will tamper with the purity of the tea. To that end, “dry” storage is seen as ideal – it retains the flavour of the original tea and thus is “better”. Long time reader of this blog probably know that I don’t necessarily subscribe to this view. In particular, I do not believe that it is important to keep the original flavour of the tea in order for the storage to be successful. If anything, the point of storage is to change the flavour of the tea away from its original character, which is often harsh and bitter, into something that is sweeter, softer, and mellower. The degree to which this change should take place varies by individuals. However, I think it is not the best idea to think that teas should be kept in a largely similar condition to when it was purchased. If that is the goal, the best choice is to buy well sealed tieguanyin or green tea and drink it when appropriate. What I think it comes down to is a problem of transmission of information – whereas it is possible to drink a lot of different kinds of teas, talk to a lot of people, read a lot of books, and see a lot of cakes if you’re in Taiwan, China, or Southeast Asia, in the US or Europe, the choices are extremely limited, prices are almost always high, and information hard to come by. What little that exists are fragmentary and prone to personal biases (including, of course, mine). There’s hope for optimism though, as years pass we all gain experience storing teas and buying teas, and give them a few more years, we will start seeing the results of storage conditions in places as disparate as Pairs, Florida, and Los Angeles. Some are bound to be disappointed, and it might not have anything to do with storage conditions as the quality of raw materials also plays a significant role. Hopefully we will all come out richer in knowledge. One of the topics that came up during Sherab’s visit on Saturday was traditional storage. Traditional storage is sometimes viewed with mythical vile — it’s bad, it’s awful, don’t do it, it’ll kill you, etc. I’ve heard versions of all that. I think slowly, people have come to realize that there are two kinds of traditional storage, so to speak — good and bad. Good traditional storage can produce great results — witness all the “classic” puerh cakes from the 50s onward, most of which received some traditional storage treatment at some point in their life. Others can be incredibly bad — cakes that are moldy inside out, growing not only the usual (and all together ok) white stuff, but also yellow, red, black… you name it. The first kind is welcomed, the second should be avoided. I think Cloud at some point or another wrote a few things for the Puerh Teapot magazine (Chinese version) that talks about traditional storage. I am not sure, but I don’t think they’ve been worked into English through the Art of Tea. I suspect, though, that it will be a useful exercise. Essentially (and this is also from my friends who are more knowledgable about this sort of thing than me) what happens is traditional storage is only one phase — usually not a very long one — of a cake’s storage life. It should not stay permanently in a “traditional” storage condition, which generally means high humidity and often accompanied by higher heat. After that, however, the cakes should be aired out and left alone in drier climes — storage units that are ventilated and not in the basement of buildings. Much of an aged tea’s life is actually spent in such storage units, not traditional basements. Also, traditional does not imply spraying water all around or anything like that. In fact, sometimes it might even be necessary to control the humidity by putting things that will absorb moisture (I believe chalk is used — spread around the floor, although my memory is fuzzy on this). The cakes that are stored in traditional storage should never touch the floor, the walls, or anything other than each other, really — they’re put on racks so avoiding the very damp floor and they’re usually placed a little away from the walls to avoid condensation, etc. You don’t want them THAT traditional. Ideally, teas that were traditional stored should spend time outside of that storage to age, and to also let the “traditional storage” flavour go away a bit. It will never entirely disappear, but it does dissipate over time. I drank some traditionally stored loose puerh today that has mellowed considerably comparing to when I first got it some two or three years ago. It is now quite drinkable, smooth, without any sort of nasty mustiness, and most importantly, it can be rebrewed many times (I think I drank around 20 today). Cooked puerh will be lucky to last 7. So if you got some stuff that smells musty and looks a bit nasty, don’t give up on it and say it’s bad and throw it away (again, this only applies to stuff with white dusting on it — yellow, red, or really any other colour mould should be avoided). Give it time, let it air out, and after a few years, it might surprise you. 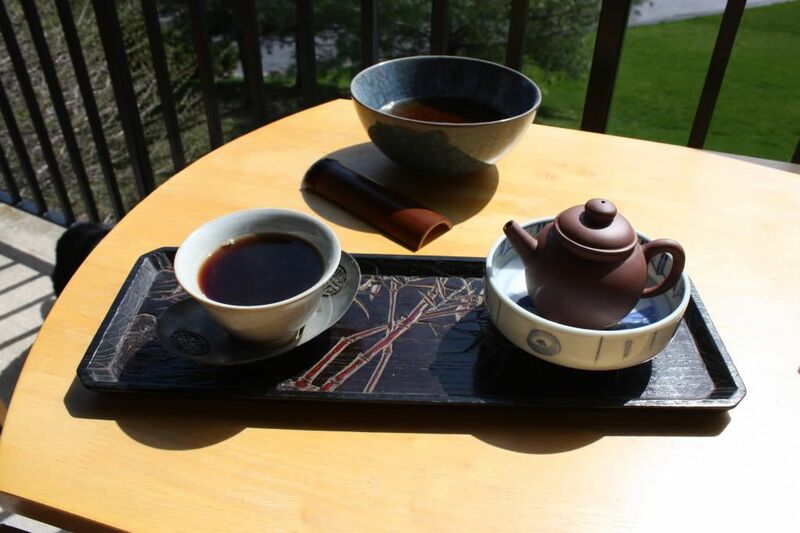 I remember when I first started out drinking puerh, mostly by way of friends who had much better stuff and who made it for me, I was often told that the best infusions for an older puerh starts with infusion 5. Yes, it begins with infusion 5 or so. Everything before is full of mixed flavours and merely a build up. In the words of one, you can pretty much toss everything up to that point. Contrast that view with many bloggers, who generally think that by infusion 5, a tea is ending or close to its end. Anything above and beyond is, in American parlance, gravy. I think at the heart of this difference is a fundamentally different style of making tea, but just as important, a fundamentally different conception of what one should get from a tea. Of course, when I say something like this I’m probably overgeneralizing a little. Yet, I do think that from what I can gather from many blogs out there, the largest focus is on the initial flavour of a tea, the strong feeling one gets from the first two or three cups and how the tea performs in the mouth in those fleeting moments. Is it apricot or is it peach? Or, maybe straw? Grapes? Mud? The list goes on. I don’t think we often see a lot of discussion of how a tea reacts in the mouth after the initial impressions. That, I think, is partly because teas are about flavours in the West — what does it taste like? That, in turn, is something that I think a product of drinking a lot of greens, low oxidation oolongs, and that sort of thing. For those things, flavour is indeed often very important. They also tend to die faster. But even in these teas, what the tea does to you and how long it does the same thing to you are very important, but I rarely see this sort of thing mentioned in reviews online. Discussions of infusions of tea after maybe 4 or 5 is usually an afterthought. Are my impressions remotely correct? I often feel the best kinds of teas are the ones that keep giving after 10, 15, 20 infusions. But I don’t tihnk I ever really see anybody talk about brewing a tea out that far, aside from a very few individuals. Are these not mentioned because they’re deemed unimportant? Or is this simply not done? I’d like to know. I remember when I was a kid, puerh was some nasty, bitter stuff that nobody sane should drink. 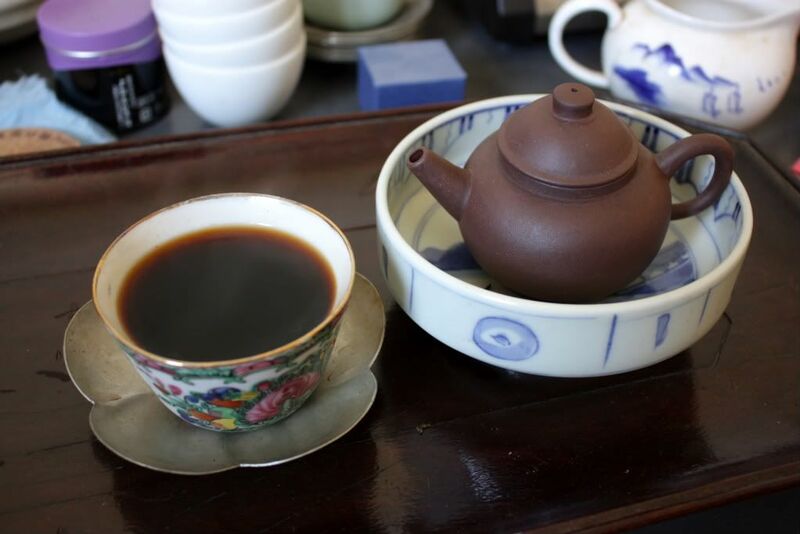 Going to eat dim sum and having puerh…. I’d skip the puerh and just eat the dim sum. Now, of course, things have changed, and puerh is no longer so bitter. I had some traditionally stored stuff from Hong Kong today, and it was smooth, sweet, and quite good for an afternoon (and evening) of tea. 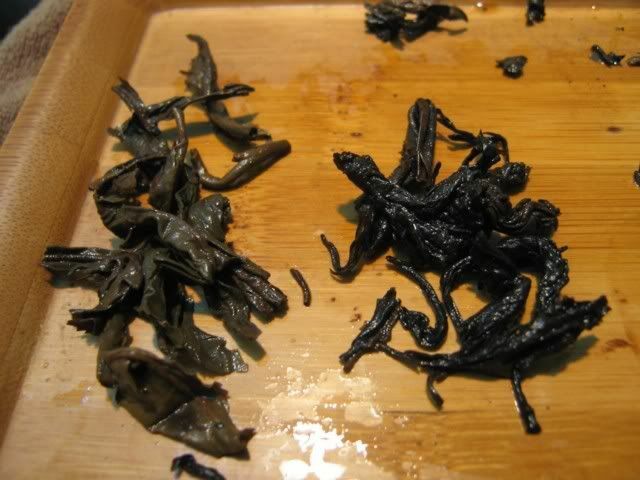 Very often such teas are described as musty, but I tend to think that the properly aged ones, especially if given suitable time in a dry environment, should not be musty at all. Earthy, of course, but not musty. It is often difficult to resist the temptation to drink such things right away when one has acquired them, because, well, they are purchased with money and nobody really wants to sit on things they bought and not touch them. Yet, I think sometimes anyway, such things should indeed be left alone even after purchase. The tea I had today was, I think, more musty when I first got it — coming straight out of a very traditional storage condition where the teas had plenty of time to rot. Two years later, drinking it now, I think it is much better — smoother without the strong storage taste. Traditionally stored taste will never leave the tea, but smooth, aged puerh taste doesn’t have to be musty. That, in fact, is what I worry about when I read pages after pages of talk, both in English and Chinese, about how traditional storage is no good and how one can’t stand such musty taste (very common among Chinese drinkers from drier climes, such as Beijing and Kunming) and how teas must be “clean”. When given a truly old tea, traditionally stored, to drink, they often think it is cooked. Therein lies the irony — cooked tea was, in many ways, an attempt by man to approximate the taste of aged puerh. 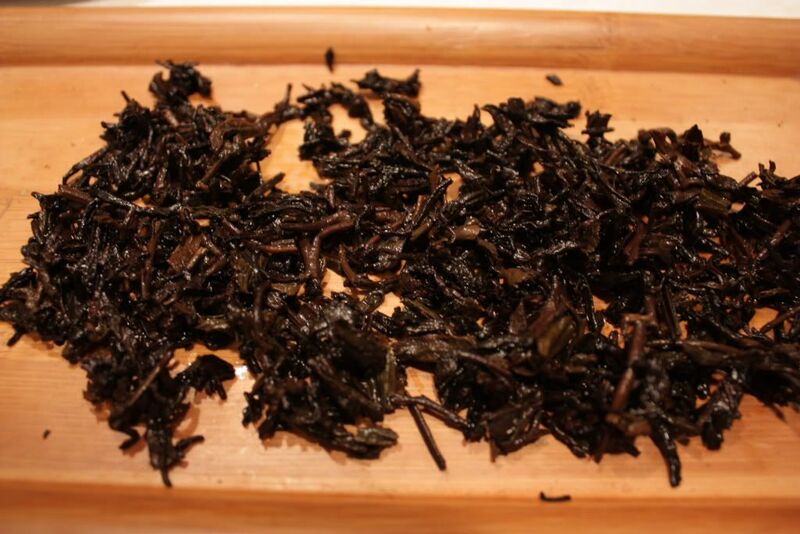 Yet, now, aged puerh is mistaken as cooked. The other more obvious irony is, of course, how cooked tea is just as, if not more, unsanitary as traditionally stored tea, especially if it’s coming from a smaller factory with unknown procedures for doing these things. I was just talking with my friend L from Beijing today, and he said after his visit to a puerh factory’s cooked tea section, he will never ever drink a small factory cooked cake again — it’s just too disgusting. Yet, out of sight and out of mind, I never hear any of these tea drinkers who demand “clean” tea telling me that cooked tea is dirty. Instead, cooked tea is wonderful — rich, smooth, good for your stomach — everything a raw tea is not (and there’s really no need for me to go through the usual arguments for raw tea, is there?). The usual retort from those who don’t subscribe to such heretical views that traditionally stored tea is bad is that they are usually espoused by people who don’t own any old, traditionally stored teas. If you only sell cakes that are 5 years old or less, all stored in a dry climate, then why would you promote a tea that you don’t have access to and that can’t be produced in your location? Indeed, it’s like a longjing seller telling you that longjing is really not that good — you should drink sencha instead. Doesn’t happen. Of course, the same people who criticize are also the ones who do the exact opposite — dry stored teas or young teas, so I have been told, are no good. They are bad for your body (that’s actually true), and they taste awful (taste depends on individuals, as everybody discovers at some point). Therefore, only what they have is good. While it is not as common in the online world, but I know some cases of “tea master”s out there who have, over time, changed positions on a number of things that they used to hold true. A case I’ve heard was actually regarding storage of oolongs — first, tea master said, only high fired oolongs can be stored. Then, after a while, tea master said low fired oolongs can also be stored. The person who told me about this noted that the change in position somehow coincided with a change in the composition of the oolongs on sale at said tea master’s store. You probably don’t need me to tell you how the composition of the teas on sale changed. I know I often seem (ok, am) quite skeptical with any sort of claims made by almost anybody regarding tea. I do have long held beliefs, but am not completely closed to changing of my mind given enough evidence. I do think, however, that it is very easy, especially when one’s source of information is only the internet, to buy too much into one side of the story without hearing another, or to treat information given by some authoritative individuals as somehow better, especially if said individual happens to sell some teas that fit right into the description of whatever is being taught. I remember being trapped that way before, and perhaps it is a case of once bitten, twice shy. I’m not saying the internet is full of snakes, but snakes can come in all forms — sometimes involuntary ones who are merely passing on bad information from others. Challenges to claims being made is generally a good thing — after all, that’s how we advance our knowledge on any given subject. If I ever make grandiose claims you think is hot air, please let me know. It’ll help keep me honest. The leaves look nondescript — traditionally stored, for sure (from the smell). Nannuo (that’s what Nan Nor is)? Who knows. But who can say no to something that can be used as a disinfectant for internal use? The taste is… interesting. It’s actually, for what it’s worth, not that bad at all. It’s cooked, sure, but it’s traditionally stored cooked, and traditionally stored cooked, IMHO, is better than non traditionally-stored cooked. The taste is richer, and it removes almost all traces of the nasty pondy smell/taste that you normally get in a cooked puerh. The tea is actually decent, which surprised me. I wonder how people who don’t know much about tea think about this? As I examined the wet leaves, I realized that this is actually a blend of raw and cooked leaves. The greenish leaves are such that they can’t possibly be cooked… I just don’t see it happening. My guess is these could be broken cakes, or at least some are broken cakes, that were thoroughly mixed in and blended together for export. The tea comes from a Hong Kong company with a Hong Kong address in the section where a lot of these old wholesalers are, so I am guessing this is just one of those traditional upstairs tea merchants who are packaging this. 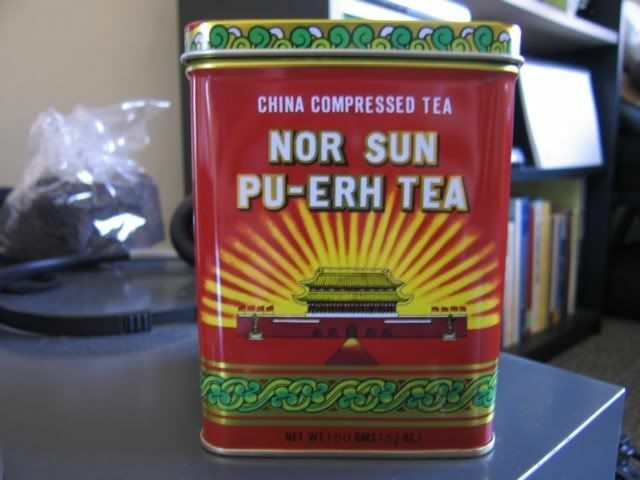 Pretty interesting, I must say, and quite a surprise to find ok puerh in Columbus OH in a tin can.